Syncing iPhone with iTunes over wifi is a popular and easy to understand feature which you can use on your new iOS 12 versions. In this regard, you will have to enable wireless syncing on your iPhone and on your system. After that, simply turn on the syncing and your device will be synced in a few minutes. In this article, you will learn the detailed steps. There are different methods to sync your iPhone including iTunes Wifi sync. In this way, you can get rid of the hassle of transferring data and information from one device to other. This method is a very fast method, and you can easily set it up. If you are looking for the detailed steps to sync iPhone with iTunes over Wifi, have a look at it below. You can complete this process in minutes. Step 1: First of all, open iTunes and connect your iPhone to your computer using a USB cable. Step 2: On the iTunes view, you will see your connected iOS device. Click on it to open your device panel. Step 3: Now click on the Summary tab, and you will see a couple of different options. Step 4: Choose the Sync with this iPhone over Wifi option and click on Apply. Step 5: Here select what you want to sync and disconnect the iPhone. Step 6: Now on your iPhone, go to the Settings app and click on the General tab. Step 7: Here you will see iTunes Wifi Sync option. Click on it. Step 8: Finally click on Sync Now and it will start syncing your iPhone. You are all done! You have successfully set up your iPhone to sync over Wifi. You can also watch the video tutorial to learn it. Besides syncing iPhone with iTunes over wifi, you can do this job using iCloud too. This process allows you to sync your data and files with another device using the same iCloud. Here is the entire step by step method. 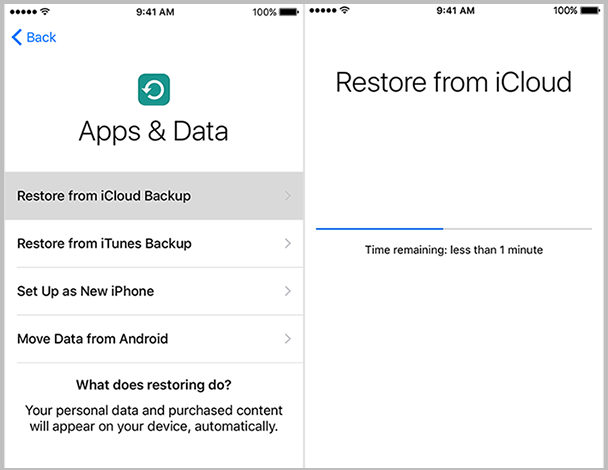 Step 2: Go to Apps & Data screen, and tap Restore from iCloud Backup. Step 3: Now it will ask for Apple ID. Place your Apple ID and password in it. Step 4: Proceed to "Choose Backup," then choose from a list of available backups in iCloud and backup your data. Both of these methods are very easy to sync iPhone with iTunes over wifi. You will just have to follow the step by step procedure in order to sync your device. You can sync any type of data like photos, videos, albums, songs, playlists, books, contacts and calendars. If you require syncing your iPhone with iTunes using a faster and more reliable way, you can try cable syncing. iMyFone TunesMate is software that can be used for this purpose.It is a faster way than iTunes wifi sync and provides some extra features like rebuilding the damaged library and managing photos, videos and other stuff. Have a glance at some of its features. Two-way Transfer - It allows you to access two-way transfer feature between your devices. 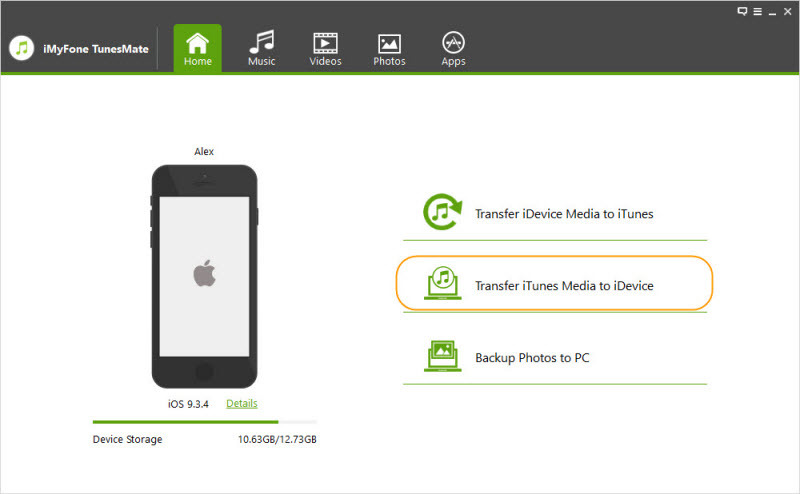 It means you can transfer your data from your PC to your iPhone and vice versa. Directly Transfer - It provides direct transfer of files and data between your devices. You can use this software to sync the important files and data without operating iTunes. All Media Files Supported - Itt provides the support of all the media files. You can transfer any type of media file using this software. Backup & Restore - You can backup your files using iMyFone TunesMate to save your precious data. It also provides the restore feature to get your restored data back. Sync without Erasing - Don't worry about your precious data while syncing or restoring it. iMyFone TunesMate provides safety and security in all terms. 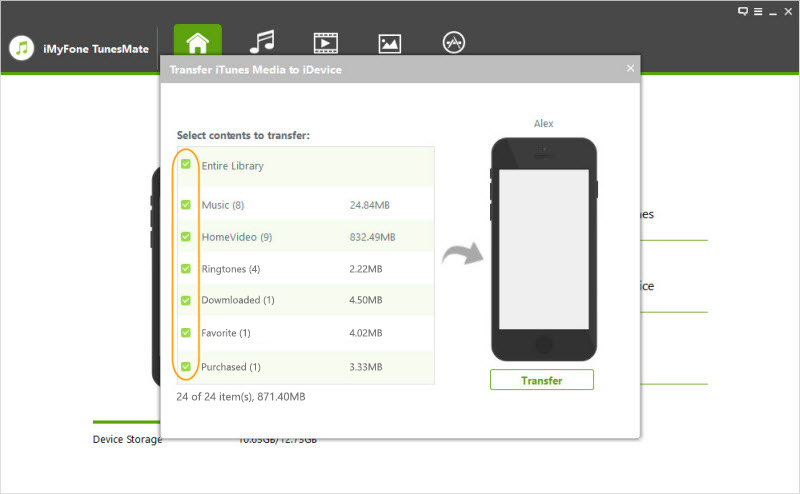 Transfer iTunes Media to iDevice is a feature of iMyFone TunesMate software. This allows you to transfer your iTunes library to iDevice. Here is how you can do this job. Step 1: Launch iMyFone TunesMate on your system and connect your device using a USB cable. Step 2: Now on the Home view, you will see three options. Click on Transfer iTunes Media to iDevice. Step 3: Here you will see your files and data of your device. Just click on the Transfer button, and it will begin syncing the files from iTunes to your iPhone. You can easily sync iPhone with iTunes over wifi or with iMyFone TunesMate over cable. While using software, it is always recommended to back up your important files and data. After backing up, you can easily start the syncing process.